One of the Anglo Saxon pieces in the Warrior Treasures exhibition of the Staffordshire Hoard particularly stood out from the rest, as it seemed to have a different design. The detailing and workmanship on this sword pommel wasn’t quite as intricate, it had different colouring – not being gold (although some little bits of gold can still be seen) – and I think its the only one decorated with a strange face, alongside its zoomorphic animal designs. I was intrigued by it and wanted to discover more about it… Does this bearded face have some significance? and what does it mean? I had come across other similar faces in Anglo-Saxon artwork and in churches, symbols for the Celtic Green Man, ancient gods and other deities. 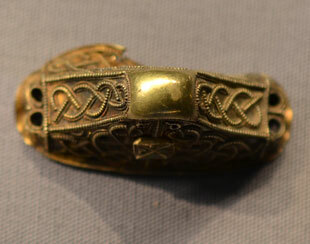 My first internet search yielded a thesis paper by Rachel D. Brewer about the Staffordshire Hoard, which had a paragraph about the piece (it was written just after the Hoard had been discovered, so there may be newer evidence that’s come to light since then). 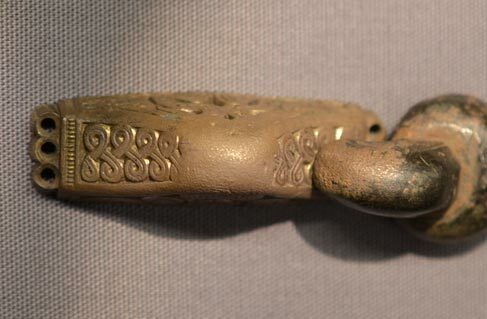 It stated that the bearded man pommel is believed to be one of the oldest items in the Hoard and from the late 6th Century, possibly of Scandinavian origin. Its made from a copper-alloy and has a ‘ski-slope’ style shape. 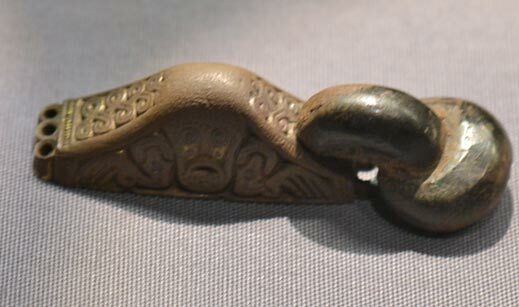 Although, in the blog post other examples of Anglo-Saxon bearded faces were featured, it does seem to fit this pommel design, as I can clearly see 2 birds/ravens on the pommel, one at either side of bearded face. There’s further info on Wikipedia about the Norse god Odin, and his companions, the wolves and ravens. The animals on the reverse side of the pommel have been interpreted as boars, the jagged teeth are quite prominent, but perhaps these could be his wolf companions? “Given most items in the hoard are dated to the 7th to early 8th century, sth711 is something quite special. It may be hundreds of years older than the rest of the hoard; a historical artifact even before it was buried. I’m completely amazed by what I discovered about it! Wow… The mysterious bearded man representing the Pagan god Wodin / Odin would indeed make it a very special sword and pommel. I think the Anglo-Saxons believed it would offer them protection and bring them good luck, especially as it had been used in many battles and had been kept and handed down the generations.